MENLO PARK, Calif.--(BUSINESS WIRE)--Dec. 11, 2017-- Intersect ENT, Inc. (NASDAQ: XENT), a company dedicated to transforming care for patients with ear, nose and throat conditions, today announced that it has received approval from the U.S. Food and Drug Administration (FDA) for the SINUVA™ (mometasone furoate) Sinus Implant, a new targeted approach to treating recurrent nasal polyp disease in patients who have had previous ethmoid sinus surgery. Placed during a routine physician office visit, SINUVA expands into the sinus cavity and delivers an anti-inflammatory steroid directly to the site of polyp disease for 90 days. Results from a randomized clinical trial demonstrated a 63% relative reduction in bilateral polyp grade (a measurement of the extent of ethmoid polyp disease) for patients treated with SINUVA, compared to control. Nasal polyps are inflammatory growths along the lining of nasal passages or sinuses that can cause nasal congestion, infections and loss of sense of smell. Many people with chronic sinusitis and nasal polyps return to their ENT specialist with symptoms within the first year following initial treatment. Approximately 635,000 Americans have had previous sinus surgery and continue to see their ENT physicians for treatment of recurring symptoms. 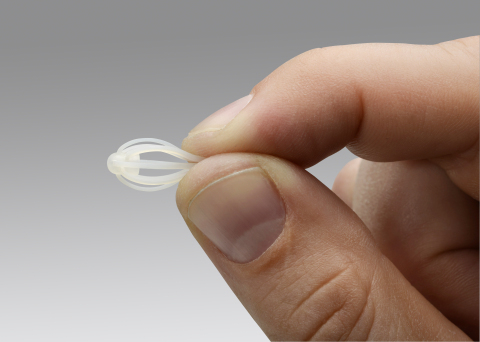 The FDA submission for the SINUVA Implant was supported by the results of clinical studies of 400 patients, including the landmark RESOLVE II pivotal study. RESOLVE II met its co-primary efficacy endpoints, which included a statistically significant reduction from baseline in bilateral polyp grade (p=0.007) and a reduction from baseline Nasal Obstruction/Congestion score (p=0.007). Secondary endpoints achieving statistical significance through day 90 include the proportion of patients still indicated for repeat sinus surgery and improvements in sense of smell, sense of nasal congestion and percent ethmoid sinus obstruction. The FDA did not require any post-approval clinical trials. The SINUVA Sinus Implant is a corticosteroid-eluting (mometasone furoate) implant indicated for the treatment of nasal polyps, in patients ≥ 18 years of age who have had ethmoid sinus surgery. Patients with a known hypersensitivity to the mometasone furoate drug, or any of the ingredients in SINUVA, should not use SINUVA. Hypersensitivity reactions, including rash, pruritus, and angioedema have been reported with the use of corticosteroids. If corticosteroid effects such as hypercorticism and adrenal suppression appear in patients, consider sinus implant removal. You may report side effects to your physician or to the FDA at 1-800-FDA-1088 or www.fda.gov/medwatch. You may also report side effects to Intersect ENT at 1-866-531-6004. RX Only. For important risk and use information about SINUVA, please see Full Prescribing Information at www.SINUVA.com. For additional information on the company or the products including risks and benefits please visit www.IntersectENT.com. For more information about SINUVA, please visit www.SINUVA.com. Intersect ENT® and PROPEL® are registered trademarks and SINUVA™ is a trademark of Intersect ENT, Inc. This release contains forward-looking statements within the meaning of Sections 27A of the Securities Act of 1933 and Section 21E of the Securities Exchange Act of 1934. Forward-looking statements should not be read as a guarantee of future performance or results, and may not necessarily be accurate indications of the times at, or by, which such performance or results will be achieved. These statements include those related to the safety, efficacy and patient and physician adoption of SINUVA. These forward-looking statements are based on Intersect ENT’s current expectations and inherently involve significant risks and uncertainties. Actual results and the timing of events could differ materially from those anticipated in such forward-looking statements as a result of these risks and uncertainties, which include, without limitation the company’s ability to successfully address FDA identified issues completely or on a timely basis, the adoption of SINUVA and the company’s other therapies by physicians, as well as other risks detailed from time to time in Intersect ENT’s filings with the Securities and Exchange Commission (SEC), including Intersect ENT’s filings on Form 10-K, Form 10-Q available at the SEC's Internet site (www.sec.gov). Intersect ENT does not undertake any obligation to update forward-looking statements and expressly disclaims any obligation or undertaking to release publicly any updates or revisions to any forward-looking statements contained herein.